The “Heel” command has a ton of value for both the pet parent and the dog because it adds control to the walk and mental exercise for the dog. It provides leadership, drains energy, and creates relaxation in ways that a loose leash walk does not. This cue asks a dog to walk directly next to you instead of behind or in front of you. The dog is working to keep pace with you, only stopping when you stop and walking when you walk. Walking at your side, on a loose leash, avoiding the temptation to sniff and pee on everything requires a lot of discipline for a dog. Walking at a human pace is actually not much physical exercise for a dog but a structured walk in heel position is a lot of mental exercise. Maintaining heel position keeps the dog in a more relaxed, working state of mind. You are constantly in your dog’s peripheral vision which is a constant reminder that you are calling the shots. The dog is taking direction from you rather than making his own decisions. Once you allow the dog to forge ahead far enough that you fall out of view it tends to be a matter of “out of sight, out of mind” and most dogs will begin to start making more choices, following less direction, and acting on their own agenda. This is where we often get pulling, leash aggression and so forth. Dogs do not need to heel at all times but it is a very valuable command that Rover-Time recommends all dogs learn and practice it on a daily basis. 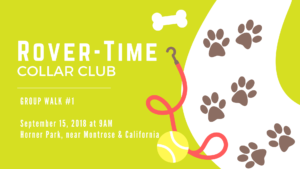 This Fall, Rover-Time customers and their friends, will gather monthly for three consecutive months in Horner Park for a group dog walk together. The walks are an opportunity to meet other dog lovers, dog enthusiasts, and pet professionals. It’s a great way to socialize dogs or puppies and it will help dogs become the best that they can be by practicing and training obedience skills in public with their owners. And it’s a fantastic opportunity to learn how to teach a dog to heel. “Teach your dog to follow a piece of food that you have in your hand. If your dog is not food motivated, use a toy instead. Walk for about ten steps and then stop. Praise your dog and reward her with the food. If you want her to sit at this time, either give her the cue word or move into her body while saying, ‘stop.’ That will teach her to stop and sit at the same time. Repeat this technique until your dog is responding well. Say your dog’s name followed by the cue ‘heel’ and move off with your hand tapping your side to encourage her to follow. Vary the routine by turning left and right or doing a figure eight, saying ‘heel’ as you turn. The sit when you stop should now be automatic. So how much of the walk should be spent heeling versus free-to-sniff walking? This is a personal choice or it will be dependent on the plan your certified dog trainer sets. The most important things to remember are that you (the walker) decide if it’s heel-time or free-sniff time at any given moment, not the dog. And, even during that free-sniff time, the dog is not allowed to pull. You should be walking the dog, not the other way around. Even if the dog is in front of you they should not be leading you. In other words you can still lead from behind, just as long as you don’t let the dog get the wrong idea. Rover-Time tends to give sniff time at special locations we’re familiar with on our daily dog walking visits, such as a park or open area and keep to heeling when traveling from one sniff place to another. Feel free to find your own balance. As with any activity that humans and dogs share, the more everyone involved is having fun and getting their needs met, the more often these activities are likely to be repeated. 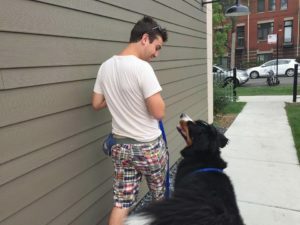 If walking the dog is such a pain and a chore that you find yourself going days or weeks without walking the dog, you will likely have a lot of other behavior issues start to bubble to the surface. If walks are enjoyable, they’ll be done more often, with bigger smiles and wagging tails. What troubleshooting questions do you have as it relates to how to train a dog to walk on a leash? Leave a question in the comments below!